In 1967, Jakob Larsen published his study of “Greek Federal States: their Institutions and History”, hoping (he said) to “fill a real need” by providing for students of ancient history a comprehensive account of this enormously important, but also frustratingly elusive, form of governance. The volume under review here has essentially the same aim; indeed, its editors present their project as one intended to produce a ‘New Larsen’. But this is more than simply an updated version of Larsen’s classic work. There is, of course, much here which does build on Larsen’s conclusions in the light of the extensive new evidence which has emerged since his volume appeared. But there are also some more fundamental differences in approach, visible partly in the more explicitly theorised analyses which are visible in many of the chapters, but above all in a move away from Larsen’s broadly narrative, diachronic structure to one based primarily around geographic and thematic concerns. The volume consists of 29 chapters, written by an impressive cast of scholars. The three opening chapters set the scene. The editors’ introduction establishes the book’s terms of reference, and offers a helpful overview of the key issues (practical and theoretical) involved in the study of Greek federal states. One of these – perhaps indeed the most fundamental – is the complex relationship between ethnicity and federalism, a problem which Jonathan Hall explores in the second chapter. Both Hall and the editors (rightly) resist a model in which a pre-established sense of ethnic unity provides the foundation for the development of a federal state; rather, they argue, the connection between these two concepts is more dynamic: a sense of ethnic identity is always closely entwined with federalism, but (as Hall concludes) “ethnicity was not simply a pre-requisite for federalization, but rather one of the means by which it was accomplished” (p. 48). A chapter from Lynette Mitchell, on Panhellenic identity, rounds out the introduction, and leads into the heart of the volume: 19 self-contained studies of federal systems (or, in some cases, groups of federal systems) from the Greek world. Each chapter provides (in proportions which, naturally, vary according to the depth and balance of evidence available in each case) a mixture of narrative discussion of the development of the respective system(s), together with more systemic analysis of their political, economic and religious institutions. The editors have been scrupulously fair in the amount of space allowed to each chapter, which does mean that very well-attested examples (the Boeotian Federation, most notably) are not explored in extreme depth, but has the corresponding advantage of allowing for thorough exploration of less well-known cases. This will surely be one of this volume’s most helpful contributions: providing a convenient, accessible and reliable first point of reference for anyone wanting to understand the nature of political (not to mention economic, religious and social) organisation in a given region, especially for those areas which are less well-served in modern scholarship. This section of the volume, therefore, performs a useful service for those interested in particular regions of the Greek world. But it also (unsurprisingly!) makes an important contribution to the systematic study of federalism, not least by its cumulative demonstration of the great diversity among systems broadly defined as ‘federal’. 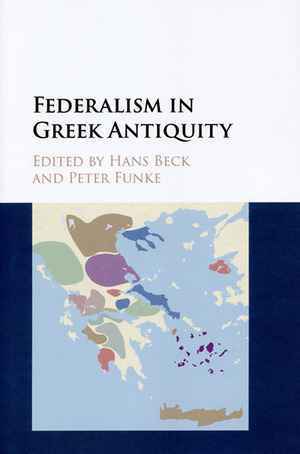 The various studies reveal quite different approaches to the quality and quantity of integration between local and federal levels of governance, differences which can sometimes be correlated with the extent to which polis-style organisation is embedded at the local level, but might also (as McInerney’s chapter on Phokis thoughtfully explores) owe much to the geographic and topographic environment in which federations operated. This sense of diversity is perhaps enhanced by the collection’s broad scope (as noted, it offers 19 case-studies; Larsen, for comparison, provided detailed analysis of 15 federations or groups of federations), and particularly by the editors’ decision to include cases where the evidence for federalism is more fragmentary or questionable: Elis and Messenia; some regions of central Greece; Kyrenaika. It is these marginal cases, in fact, which generate some of the most interesting discussion in the book (certainly for readers interested in wider theoretical questions about the nature and limits of federalism) precisely because they draw attention to the ways in which federal government might, or might not, be distinguished from other forms of inter-community collaboration or co-operation (McAuley’s exploration of the federalism – or regionalism? – of Kyrenaika is especially illuminating in this respect). The final section of the book returns to the thematic approach. Two chapters discuss other, non-federal, forms of interstate organisation. Here, Smarczyk’s investigation of late Classical and Hellenistic leagues is particularly useful in drawing out the distinctiveness of federal organisation, and the reasons why some federations and interstate organisations failed while others succeeded. Ager offers a similarly thoughtful and cautious assessment of both the virtues and the limitations of federations in the preservation of peace and stability in interstate politics – an important corrective to Larsen’s surely overly-optimistic view of federations as the potential panacea to the problems of the chaotic Greek interstate system. Mackil’s excellent chapter on the finances of federations is a real highlight of the volume, drawing together with admirable clarity the various modes of economic exploitation and co-operation visible in the systems discussed elsewhere in the work. (The absence of any chapter which attempts the same sort of synthesis for other aspects of federal activity – perhaps especially political activity – is notable: is this because practice is so diverse that such a synthesis would simply be impossible?) The work closes with two brief but thought-provoking studies of the political theory of federalism: one (by Bearzot) on ancient views, and a final piece (by Lehmann) on the influence of Greek federalism on the development of the American constitution. In sum: this book represents a valuable addition to scholarship on Greek politics, and indeed on Greek history more widely. It will be an essential reference work for all Greek historians, acting as a useful complement and supplement to the Copenhagen Polis Project’s Inventory, but should also act as a catalyst for further study of this complex and fascinating aspect of Greek political activity. Jakob A. O. Larsen, Greek Federal States: their Institutions and History, Oxford 1967, p. I.
Polly Low: Rezension zu: Beck, Hans; Funke, Peter (Hrsg. ): Federalism in Greek Antiquity. Cambridge 2015 , in: H-Soz-Kult, 26.09.2016, <www.hsozkult.de/publicationreview/id/rezbuecher-25285>.